this is a super solid CDI unit, very reliable with lights! comes with full complete instructions, with step by step instruction and color photos + wiring diagram. 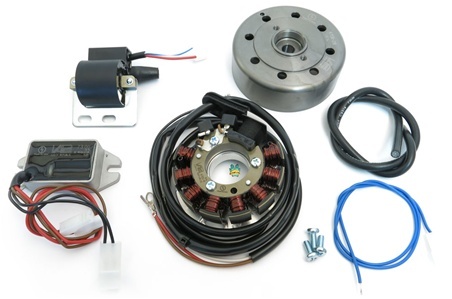 magnet based generator with integrated fully electronic ignition. output at 12 volts / up to 100 watts DC. solid state. maintenance free, electronic ignition! modern technology for brilliant lights and solid spark (solid state)! stator designed specifically for derbi so no confusing mounting! better starting, better fuel burning! A bit pricey however bolted right up and runs great.Thought about hooking up a portable welding unit to it! Not Actually! Very nice unit!